Last month Alexander Wang presented his last NYFW show. Holding his AW18 presentation in the old Vogue office on Times Square, the designer showed leather skirt suits, long coats, and tiny sunglasses that wouldn’t look out of place worn by The Matrix’s Trinity. 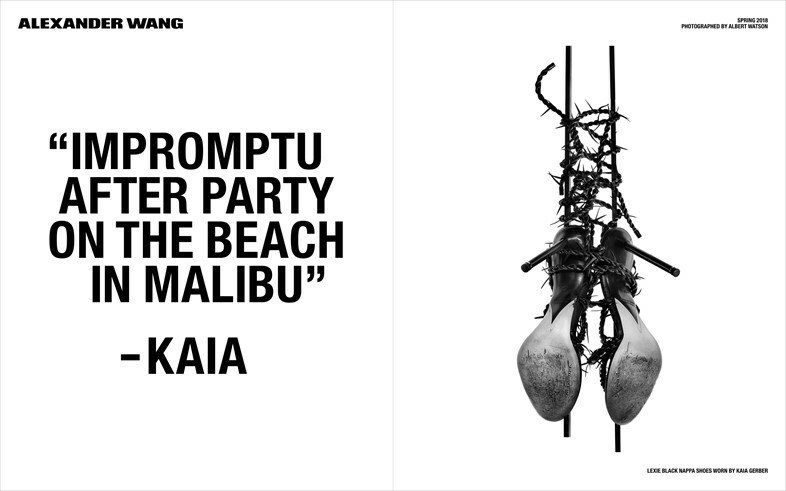 Wang has now released his SS18 campaign, which forgoes the usual gang of models to focus on pieces worn by the likes of Kaia Gerber, Zoë Kravitz and Behati Prinsloo. Photographed by Albert Watson, who is known for his black and white portraits of icons like Kate Moss, Tupac, and David Bowie, the images feature quotes from those involved next to the items they have worn. From a deconstructed t-shirt dress and a cropped tank top stretched out by clips, to a pair of stilettos wrapped in barbed wire, the images are shot in the B&W style that Watson is known for. “To photograph the clothing or item as a study after the subject wore it felt especially timely, removing her from the photograph but retaining her vibrant spirit,” Wang said on his idea for the campaign. In similar non-traditional fashion to the model-less campaign, Wang will no longer present his collections alongside his New York peers but will instead show in line with pre-collection presentations in June and December.